Expand Your Chest Dimensions With Flyes! Formulating a great chest workout goes a long way to enhancing your upper body. Here are a few exercises and tips to really bring out the chest. After spending some time on a basic strength development workout, you might start thinking about really targeting in on some muscles that you feel are lagging behind and that you really want to bring up. For many of you, this is the chest. Formulating a great chest workout goes a long way to enhancing your whole upper body because of the fact that it's going to incorporate the triceps and biceps as well, since many chest movements will call these muscles into play as stabilizers. When you want to specifically zero in on the chest, the one way to do this is with flyes. Since the flye movement will place much more emphasis on the pectoral muscles, it's a good movement to use during your chest workout for maximum definition. Now, before you go adding in some version of flyes to your workout program, it's a smart idea to first think about where you'd like to place the flyes. One technique is to actually perform the flyes first before doing any other chest movements (bench press, incline press, etc). When you set it up as such, you're following a principle known as the pre-fatigue principle, where you tire out one muscle with an isolation exercise before going to a compound movement where it will be working again, only this time with some synergists as well. On the other hand, the next option is placing your flyes after you do your more compound exercises. In this case, you will allow yourself to focus a little more on maximum strength development, since you will be hitting the lift where you are able to lift the most weight since you are feeling most fresh. If you were to instead do the pec flyes first, you would have tired out the chest, thus you wouldn't be able to lift quite as heavily during the compound lifts as you otherwise would. After deciding whether you're going to place your flyes first or later on in your workout, then it comes time to look at which fly variation you're going to place in your workout program. Below are some of your options along with the specific benefits you'll get from each. When doing your flyes on a flat bench, you will target the chest as directly as possible since you are on the horizontal plane of movement and you are fully supported by the bench below you. This is a good option for people who do want to keep up their strength levels, pushing themselves to a new limit. Be sure when doing these flyes that you pay attention that your back does not come up off the bench however; that's the most common mistake you see people making on this exercise. The next exercise you might want to consider are incline bench flyes. 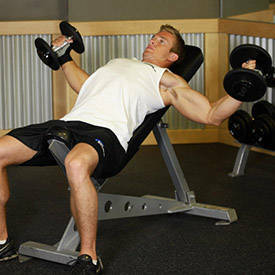 These, while still targeting the chest, also hit the shoulders as well (a minor amount due to the incline you are on). There is also a lower chance that your back will arch off the bench while doing this exercise as well, making it a good option for people who suffer from back pain. When doing incline bench flyes, one thing you do want to focus on is making sure that you contract as much as possible through the chest muscle itself; it's easy to place more emphasis on the shoulder muscles. Another option for working your chest with flyes is through the use of a cable machine. With this one, you can perform these flyes standing or lying on a bench as well, with the bench placed in between the two cable pulleys. The nice thing about cable flyes is that they will work the abdominal muscles to a larger extent if performed when standing, since the abs will work as stabilizers throughout the movement. In addition to this, cable flyes make it a little easier to do one-arm flyes if that's something you'd like to incorporate into your program, perhaps if you are suffering from a slightly weaker side for example. Note though that it's not recommended to just strictly do flyes on one side while leaving the other without, since that too could create a muscle imbalance over time. Instead, either consider doing individual arm flyes by utilizing a different weight with the arms (done separately) or throw in an additional set or two at the end of the workout for the weaker side. Finally, the last option when it comes to adding flyes to your chest workout is flyes performed on an exercise ball. These are going to be very good for those who are really looking to create a dynamic workout that will target in on the core. You won't typically be able to lift as heavy of a weight when doing flyes on an exercise ball due to the fact that your balance will definitely be impacted, but you will still be challenging the chest muscles effectively due to the instability created. Finally, the last factor to consider when designing a workout to expand your chest dimensions with flyes is how many sets and reps you should do, along with how frequent to place these in your program. If you are on an upper/lower type of body split, typically you could do one flye movement with each upper body workout you do. Note that you should still be making an effort to perform the bench press as well, since that is still the core chest movement that needs to be included. The flyes will simply compliment your training program, helping to maximize the stimulus placed on the chest muscle. The Poe Show: Challenging Chest Training! Typically most people will bring the rep range slightly higher on flyes to help stimulate hypertrophy to a great extent and because of the fact that you generally aren't lifting a maximum amount of weight with this movement to begin with. Just 2 or 3 sets of 8-12 reps should put you nicely where you want to be for flyes, incorporating a different variety every few weeks on your program to give a maximum amount of stimulation. So, keep these points in mind as you go about designing your chest workout. When incorporated in correctly, pec flyes can definitely help you increase your dimensions and bring out muscle definition you haven't seen before.